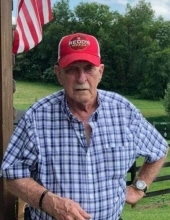 Celebrating the life of Charles Elmer Durney, Sr.
Obituary for Charles Elmer Durney, Sr.
Charles Elmer Durney, Sr., known by friends as “Sarge”, age 82, of Baldwin Township, PA, passed away peacefully on November 28, 2018 at the VA Pittsburgh Healthcare System after a brief illness. Sarge proudly served for 42 years in the US Army, retiring as Sgt. First Class. He has been an active member of the Castle Shannon American Legion, for 21 years. During that time, he served in various positions within the Legion, including Commander, Secretary, and currently as the Vice President of Post 490. The Legion members were like a second family to him, and he cherished spending time with them. His ability to sell raffle tickets will be hard to replace. He was an avid bowler and enjoyed the years he got to spend with his friends in the bowling leagues. This was something he looked forward to each and every week. He is survived by 3 children: Pamela (Matthew Mutschler), Charles Durney, Jr. (Lori), and Lisa (Scott Plucinski), 8 grandchildren: Jessica, Danielle (Brandon), Chelsie, Cecilia (Zane), Cody (Brittany), Izabella, Gabriel, and Isaiah, 10 great-grandchildren: Damon, Ashlyn, Macksen, Evelyn, Wyatt, Caiden, Jase, Noah, Jonah, and Lincoln. He was anticipating the arrival of his 11th, Graysen, in March 2019. He is also survived by 2 brothers, Thomas and Richard, and 1 sister, Arlene. He was predeceased by Nellie Durney, his grandson, Jason Plucinski, his parents, Edward and Florence, and his brothers, Claire and Edward. Sarge had a good life that he enjoyed to the fullest. He will always remain in the hearts of his family and friends. Visitation will be held on Sunday, December 2 from 12 to 3 pm & 6 to 8 pm at the Jefferson Memorial Funeral Home, Inc., 301 Curry Hollow Rd., Pittsburgh. A Blessing Service will be held on Monday, December 3 at 12 noon in the funeral home's chapel. In lieu of flowers, contributions may be made in Sarge's memory to the American legion, Post 490, 1008 Castle Shannon boulevard, Pittsburgh, PA 15234. Condolences may be left at www.jeffersonmemorial.biz. To send flowers or a remembrance gift to the family of Charles Elmer Durney, Sr., please visit our Tribute Store. "Email Address" would like to share the life celebration of Charles Elmer Durney, Sr.. Click on the "link" to go to share a favorite memory or leave a condolence message for the family.